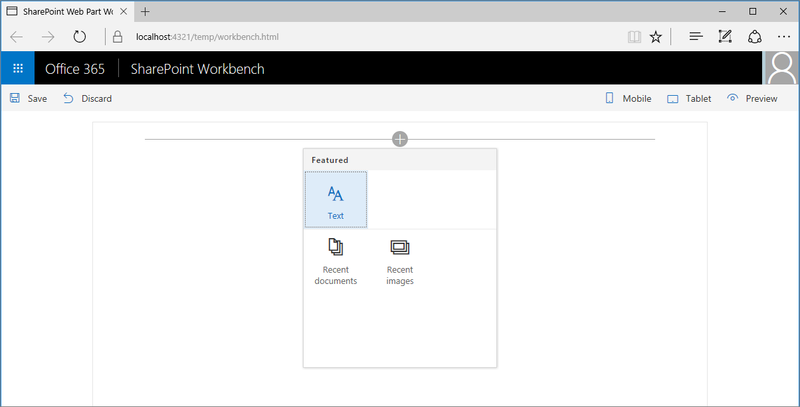 More complex SharePoint Framework client-side web parts likely have many properties that the user must configure. You can help users by adding preconfigured property entries for specific scenarios. A preconfigured entry initializes the web part with pre-set values. Before following the steps in this article, be sure to set up your SharePoint client-side web part development environment. One of the properties specified in the web part manifest is the preconfiguredEntries property. The preconfiguredEntries property provides information about your web part for use in the web part toolbox. When users add web parts to the page, the information from the preconfiguredEntries property is used to display the web part in the toolbox and define its default settings when it's added to the page. If you've built classic web parts with full-trust solutions, you can think of each entry in the preconfiguredEntries array as corresponding to a .webpart file. Just like a .webpart file, each entry in the preconfiguredEntries property is linked to the web part code and specifies basic information about the web part, such as its title or description as well as default values for its properties. Each item in the preconfiguredEntries array consists of several properties. The following table explains the purpose of each property. officeFabricIconFontName string no The icon for the web part that is displayed in the toolbox. Its value must be one of the Office UI Fabric icon names. If this property has a value, the iconImageUrl property is ignored. "officeFabricIconFontName": "Sunny"
iconImageUrl string no The icon for the web part that is displayed in the toolbox and is represented by an image URL. The image at the URL must be exactly 40x28 px. If the officeFabricIconName property does not have a value, this property must have a value. "iconImageUrl": "https://cdn.contoso.com/weather.png"
groupId string yes The group ID to determine which modern group contains the web part in a modern site page. The SharePoint Framework reserves group IDs for predefined groups. The developer can pick one from those groups. If the developer fills an ID not in the predefined groups, it falls back to Other group. "groupId": "1edbd9a8-0bfb-4aa2-9afd-14b8c45dd489"
dataVersion string no Use this field to specify the data version of the pre-configured data provided to the web part. Note that data version is different from the version field in the manifest. The manifest version is used to control the versioning of the web part code, while data version is used to control the versioning of the serialized data of the web part. Refer to the dataVersion field of your web part for more information. Supported values format: MAJOR.MINOR version "dataVersion": "1.0"
Some web part properties have a value of type ILocalizedString. This type is a key-value pair object that allows developers to specify strings for the different locales. At a minimum, a value of type ILocalizedString must contain the default value. Optionally, developers can provide the translations of that value to the different locales that their web part supports. If the web part is placed on a page in a locale that isn't listed in the localized string, the default value is used instead. There are 7 out-of-the-box groups as shown in the following table. Use the group ID in the groupId property. Text, media, and content cf066440-0614-43d6-98ae-0b31cf14c7c3 Web parts that display text, multi-media, documents, information from the web, and other rich content. Discover 1edbd9a8-0bfb-4aa2-9afd-14b8c45dd489 Web parts that organize, group, and filter content to help users discover information. Communication and collaboration 75e22ed5-fa14-4829-850a-c890608aca2d Web parts that facilitate information sharing, team work, and social interactions. Planning and process 1bc7927e-4a5e-4520-b540-71305c79c20a Web parts that empower team productivity with the use of planning and process tools. Business and intelligence 4aca9e90-eff5-4fa1-bac7-728f5f157b66 Web parts for tracking and analyzing data, and for integrating business flow with pages. Site tools 070951d7-94da-4db8-b06e-9d581f1f55b1 Web parts for site information and management. Other 5c03119e-3074-46fd-976b-c60198311f70 Web parts not in other groups. If the developer fills an ID not in the previous list, the web part falls back to the Other group. 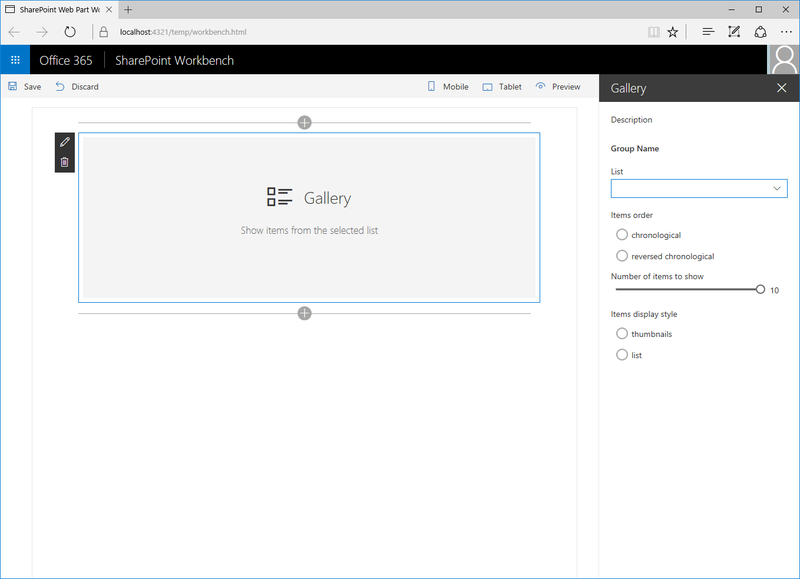 To see how you can use preconfigured entries when building web parts, you will build a sample gallery web part. Using several properties, users can configure this web part to show items from a selected list in a specific way. For brevity, you will omit the actual implementation of the web part logic and will focus on using the preconfiguredEntries property to provide preconfigured versions of the gallery web part. Start by creating a new folder for your project. Go to the project folder. In the project folder, run the SharePoint Framework Yeoman generator to scaffold a new SharePoint Framework project. Open your project folder in your code editor. 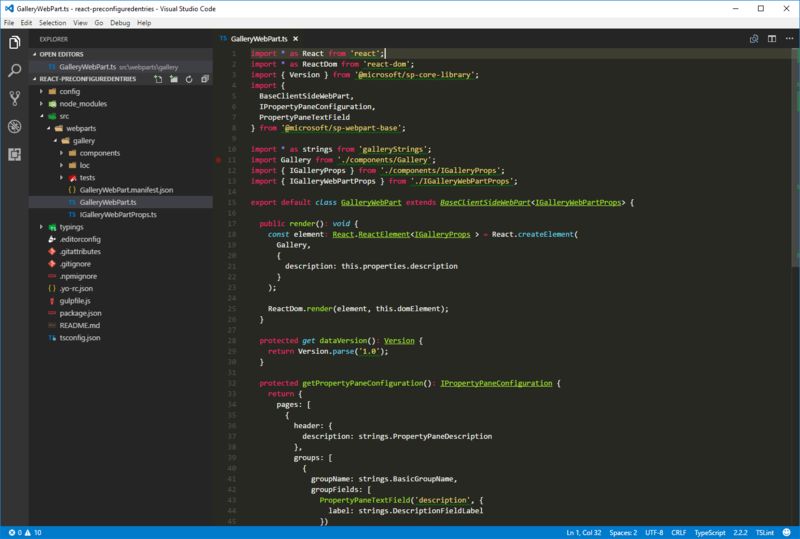 This article uses Visual Studio Code in the steps and screenshots, but you can use any editor you prefer. In the web part manifest, add web part properties so that users can configure the gallery web part. In the code editor, open the ./src/webparts/gallery/GalleryWebPart.manifest.json file. The listName property specifies the name of the list from which list items should be displayed. The order property specifies the order in which items should be shown, that is chronological, or reverse chronological order. The numberOfItems property specifies how many items should be displayed. The style property specifies how the items should be displayed, such as thumbnails, which is useful for showing images, or as a list, which is more suitable for documents. Web part properties specified in the manifest must also be added to the web part properties interface. 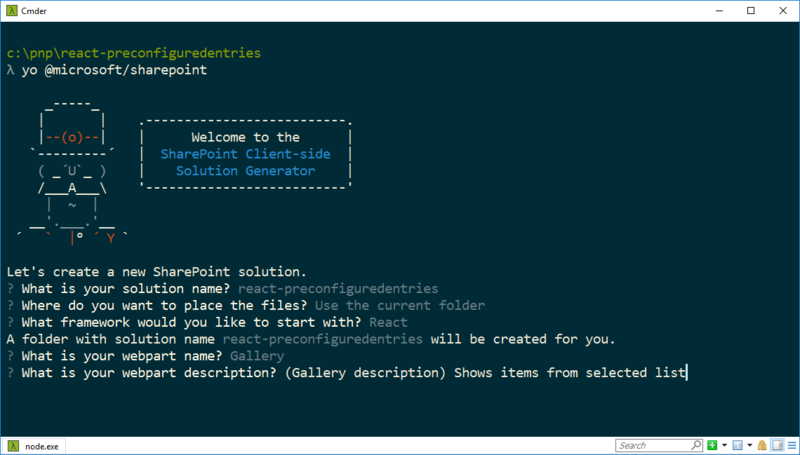 When building SharePoint Framework client-side web parts using React, after changing the web part properties interface, you need to update the web part's render method that uses that interface to create an instance of the main React component. 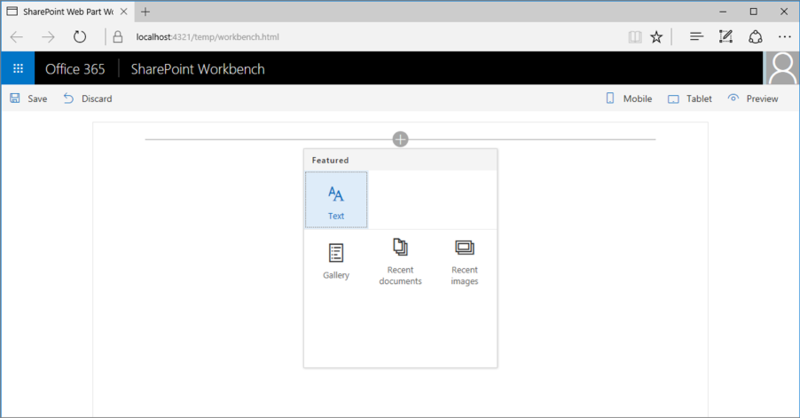 Customize SharePoint experiences using web parts. For users to be able to use the newly defined properties to configure the web part, the properties must be displayed in the web part property pane. In a real-life scenario, you would retrieve the list of lists from the current SharePoint site. For brevity, in this example, you use a fixed list instead. In the web browser, add the web part to the canvas and open its property pane. You should see all the properties available for users to configure. Because you didn't specify any default values for the web part, every time users add the web part to the page, they have to configure it first. You can simplify this experience by providing default values for the most common scenarios. Imagine that users often use the gallery web part to show the five most recently added images. Rather than requiring users to configure the web part manually each time, you could provide them with a preconfigured version that uses the correct settings. If you were debugging the project previously, stop debugging and start it again. Changes made to the web part manifest are not automatically reflected in the Workbench while debugging, and you have to rebuild the project to see them. When you open the web part toolbox to add the web part to the canvas, you see that its name and icon changed to reflect the preconfigured settings. After adding the web part to the page, it works immediately by using the preconfigured settings. Imagine that another group of users often uses your gallery web part to show documents recently added to their site. To help them use your web part, you can add another set of presets that addresses their configuration needs. Notice how you keep the previous preconfigured entry intact and add another one next to it by using different values for properties. When you open the web part toolbox to add the web part to the canvas, you see that there are two web parts for you to choose from. After adding the Recent documents web part to the page, it works immediately by using its specific preconfigured settings. When building web parts, there are often specific scenarios that the web part should support. Providing preconfigured entries for those scenarios makes it easier for users to use the web part. Depending on how you build your web part, it could be possible that the web part can support other unforeseen scenarios as well. If you only provide specific preconfigured entries, users might not realize they can use your web part for a different scenario. It might be a good idea to provide a generic unconfigured variant of your web part as well. Notice that the generic unconfigured version of the web part is added next to the configurations that target specific scenarios. This way, if there is no specific configuration addressing users' needs, they can always use the generic version and configure it according to their requirements. When you open the web part toolbox to add the web part to the canvas, you see that there are now three web parts that users can choose from.